A Minesweeper program that will sweep you into a fun, classic puzzle! Find all the mines on the screen to win. 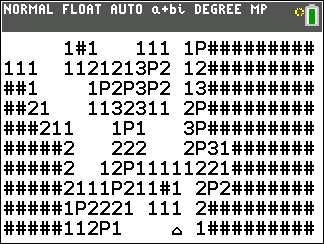 This version includes varying difficulties, different text and control styles, custom options, automatic clearing, and a saving and loading feature, all written in pure TI-BASIC for the TI-84+C calculators. Happy solving! A basic Connect 4 game for local multiplayer. Compatible with MirageOS. Peggle is a fun and addicting physics based game. The game consists of 9 levels composed of several different types of blocks. You are given 9 balls to shoot into the arena to try to hit as many blocks as possible, resulting in them being erased at the end of a turn. If all blocks are erased, you proceed to the next level. Have you played 15 square before? Well this is XSquare. You can create any size field between 2-5 for the length and 2-7 for the width. See the readme for more details.